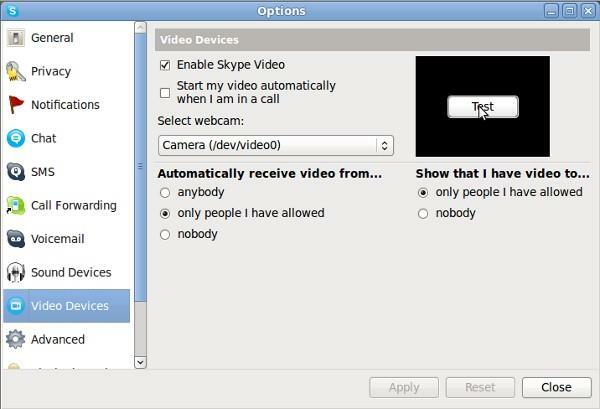 THIS RECIPE WORKS WITH THE NEW V4.0 SKYPE FOR LINUX! yAy! Video Chat Cameras are nice. 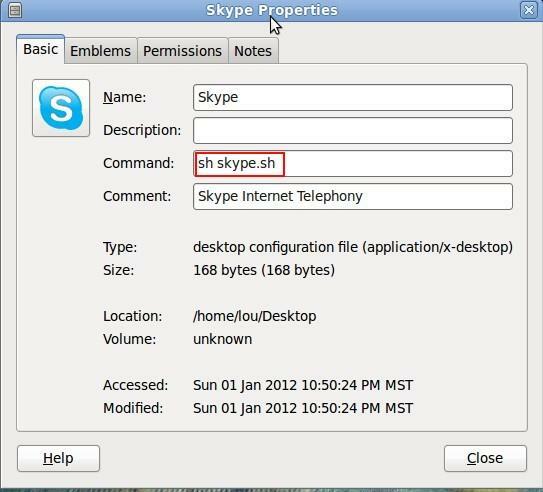 But they don’t always play nicely with the Linux version of Skype. 2. First step first. Let’s see if the camera works with Linux Cheese. Cheese is a local loopback programme. It takes the output from the camera (/dev/video0) and loops it right back for you to view. If successful, this will tell us, that Linux recognizes the camera, and that it works. The light may/may NOT be on. 3. Let’s try the next step: Installing Skype. Lets get the latest version of Skype from the website. The latest Linux version (as of this writing) is: 2.2.0.35. (YES, that is far far behind the Windows Version) — Since Microsoft owns Skype, the future of the Linux version is an unknown at this point. They have a version for Debian, and 32 and 64 bits. The example shown above is for the 32 bit Ubuntu version. So make sure you get the right version, and make sure you get the right architecture: 32 or 64 bit. TO GET SKYPE TO WORK ON A 64 BIT DEBIAN SYSTEM. Yeah makes no sense, but you need this if you are running 64 bit DEBIAN Skype. 5. If you do not already have a Skype account, sign up for one. Just follow the prompts. Test the audio by using the Skype Test Call. 6. Let’s try the video. RIGHT click on the green skype logo in your task bar, then LEFT click on Options/Video Devices. Now hit the test button. You should hopefully see an image. If you do not, don’t panic! This article gave me the information I needed to get it working. But of course, I found a much simpler method then what was given. 7. If you have no video, and this was especially true with the some of the Web Chat Cameras, all you may need to do is to pre-load the needed libraries. note that the library path name /usr/lib/libv4l/ may be different on your machine. This happens the be the correct path for 32 bit Ubuntu 10.04. The LD_Preload loads the Video for Linux Libraries, which Skype needs, but doesn’t get. Repeat step 6, and the video should now work!